Offering you the best selection, most complete information and best prices. Some people call them stretcher mattresses. Others call them stretcher pads. Either way, you save 40% - 50% with us when comparing the same product from our biggest competitor. We offer both foam and static pressure reduction surfaces for all types of stretchers. Our mattresses/ pads are used on Surgery, E.R., Recovery, Trauma, OB/ GYN Gynnie stretchers. They are also used on Radiology, Transportation, Ophthalmology/ ENT/ Eye stretchers, Flouroscopy/ C-Arm stretchers and Pediatric stretcher cribs. 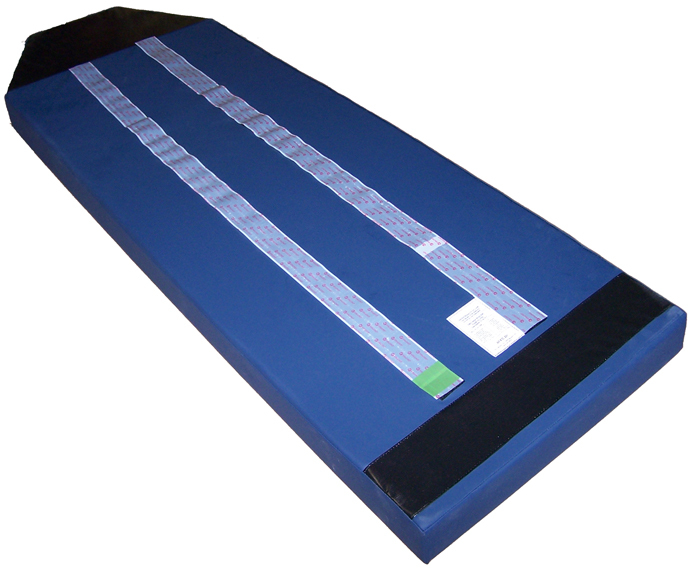 We also offer a complete line of pads for surgical tables, surgical armboards, arm/ hand tables and other surfaces. and Softcare stretcher mattresses are available in seven different colors at no additional cost to you. 2) For standard Stryker/ Hill-Rom procedure, recovery, E.R. or transport stretchers, select from the 4 mattress corner styles shown below. Click under your preferred style. Complete this form with the basic measurements. Fax this completed page with your order. Do you need an OB/ GYN/ Gynnie, Eye/ ENT, C-Arm or Pediatric stretcher crib pad? Scroll further down on this page for pricing. 3) Choose your mattress comfort and durability level. Cut-away photos are shown below to help you with your mattress/ pad selection. 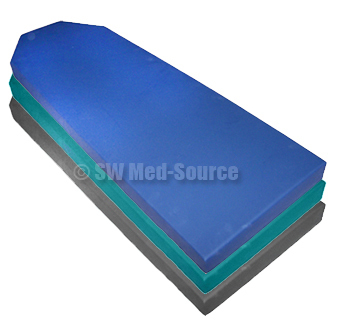 The Standard Stretcher Mattress is typically used in Transportation and Radiology and other areas requiring only short patient stays. Features a medium density supportive #1845 polyurethane foam with a firm, conductive Naugahyde cover. Recommended for patient transport and/ or short patient stays. This Standard Mattress is equivalent to the standard mattresses often provided with many new stretchers. Recommended for use in areas where there is a minimal amount of fluid contamination. Although covers are constructed with non-penetrable surfaces, bodily fluids can enter through the very small stitched seams on Standard Mattresses. 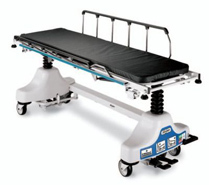 The Deluxe Stretcher Mattress is typically used in Ambulatory/ Same Day/ Outpatient Surgery, Radiology & Transportation. Features a medium density supportive #1845 polyurethane foam with a conductive Fusion Top Cover and Naugahyde bottom material. This stretchable, pliable conductive top fusion cover with a polyurethane coated stretch knit material is very durable. 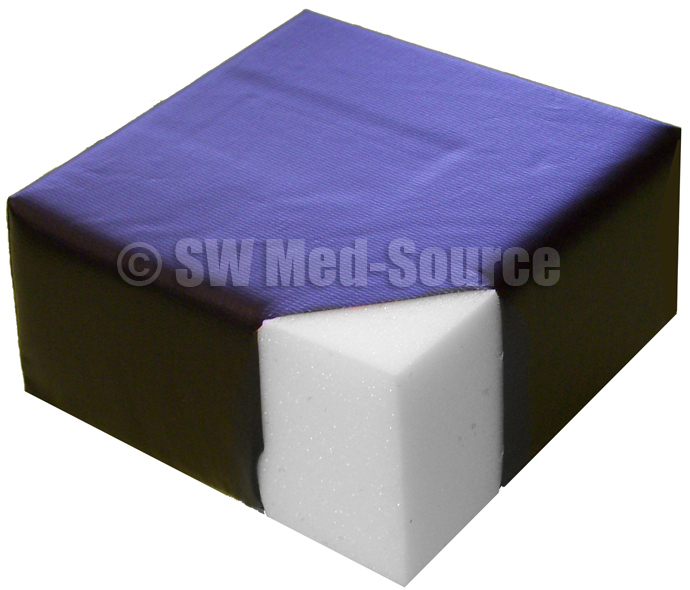 This cover reduces the risk of shear, provides added comfort and aids in the prevention of pressure ulcers. This Deluxe Cover has a non-penetrable surface. Ultrasonic welded seams provide a tight seal against fluid penetration. Ideal for fluid-intensive areas. Warranty: 1 year on materials and workmanship. The Softcare 2 Layer Stretcher Mattress is typically used in PACU, Endoscopy, Ambulatory/ Same Day Surgery, Extended Stay and Emergency Areas. Features memory foam that cradles your patient's bony prominences and molds to their anatomy. The stretchable, pliable conductive fusion cover provides added comfort and aids in the prevention of pressure ulcers during longer patient stays and/ or with higher risk patients. The polyurethane coated stretch knit cover material also means added durability and longer life. Welded seams provide a tight seal against fluid penetration. They will not fray or unravel. Ideal for fluid intensive areas. This is a superior quality mattresses offered at a very good price. The Softcare 3 Layer Stretcher Mattress is typically used in PACU, Endoscopy, Ambulatory/ Same Day Surgery, Extended Stay and Emergency Areas. Features triple layered foam construction. Top layer consists of memory foam. Middle layer is a medium density supportive #1845 polyurethane foam. Bottom layer is a high density rubber material that reduces the risk of patients bottoming out on the hard surface. The polyurethane coated stretch knit cover material means added durability. Welded seams and a polyurethane coated stretch knit cover material means better durability/ longer life. 4) Finally, just select your stretcher mattress size from the choices shown below and order. in Surgery, Recovery, Trauma, Transportation, etc. stretchers used in Surgery, Recovery, E.R. Trauma, Radiology and other areas. Note: Please fax a completed "corner style" sketch form (shown above) with your order. If your pad is a slightly different size than what is listed below, we'll just do it for the same price. 5 ea. SO-2674-4-140-A Softcare 2 Layer Stretcher Mattress, 26"w x 74"l x 4" thick with #170 Navy color and letter A corner style. $399 ea. than what is shown. 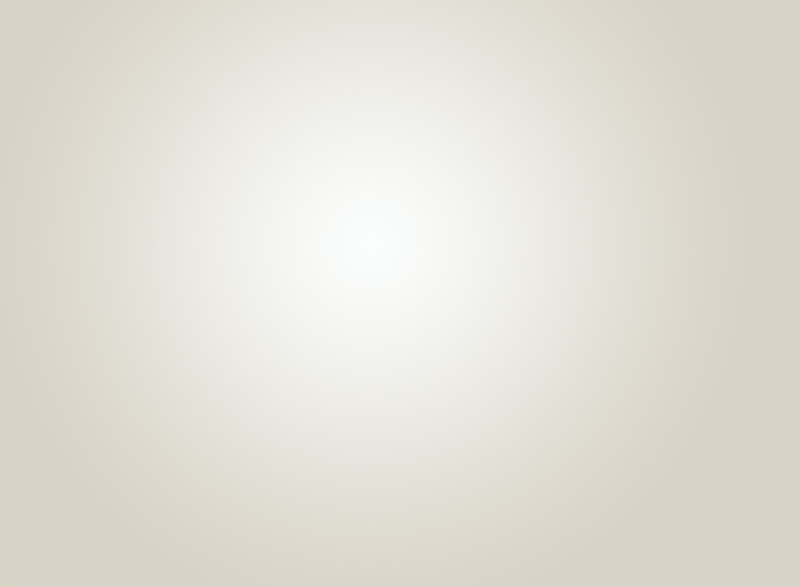 Just select the corner style at the top of the page, click on it, complete the form and fax or email it to us. The price has more to do with the material/ comfort level selected. We average the price for the various sizes to make it easier to order. Welded seams will not fray or unravel. This type of seam provides a tight seal against fluid penetration. However mattresses cannot be submerged because of the very small vent flap that regulates air flow. This upside down vent flap can be found on nearly all stretcher mattresses. Note: Please fax completed Corner Style Form with your order. See above choices. We want to be certain your mattress size is correct! to you to be certain it matches the shape and dimensions of your existing stretcher mattress. A typical order would read as follows: 1 ea. DPW-6189360-3 Deluxe Mattress with welded seams, 25"w x 76"l x 3" thick with #170 Navy color. $270 ea. Note: Some of the above stretcher models have separate head and shoulder extension pads. These pads are available at an additional cost. Please contact us with your specific pad needs. We will email a sketch to you to be certain it matches the shape and dimensions of your pad. can purchase our best Softcare 3 Layer Mattress for just $495! seams, lowest price, Black only. A typical order would read as follows: 1 ea. SO-1061-4 Softcare Stretcher Mattress w/ welded seams, 4" thick, 2 piece set, with #170 Navy color. $395 ea. of your mattress and the desired comfort level, we may be able to provide you with a quotation and accommodate your needs. 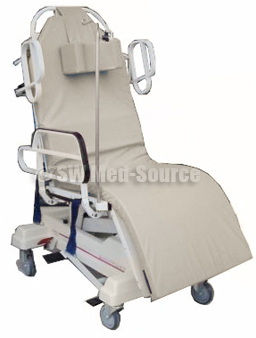 SW Med-Source sells replacement 2" & 3" thick flat mattresses for the Wy'East Medical TC-300 TotaLift II Lateral Patient Transfer Chair. Includes tapered corners and a non-skid bottom surface. See alternate image for bottom view of mattress. Dimensions: 23" wide x 68" long. You can easily identify your department's chairs at a glance with our color coded mattresses. pliable Deluxe Fusion cover. The Naugahyde cover is less expensive and is available in the four different colors shown below. The Deluxe mattress with a Fusion cover is more expensive. It is available in the eight different color choices shown below. Order using the correct stock number: Sample stock numbers shown below. Choose from either 2" or 3" thick mattresses, same price. Note: Contoured Headrest Pad is optional. Call us at 1 888 424-1740 for pricing or with any questions . you can purchase from us at a significant savings? 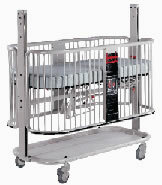 Hard Manufacturing®, NK Medical® and Pedicraft® hospital pediatric cribs. ADDITIONAL INFORMATION TO BE ADDED SOON. PLEASE CONTACT US FOR PRICING. Oak Works®, Global Star, Medstone, Healthtronics and other brands. 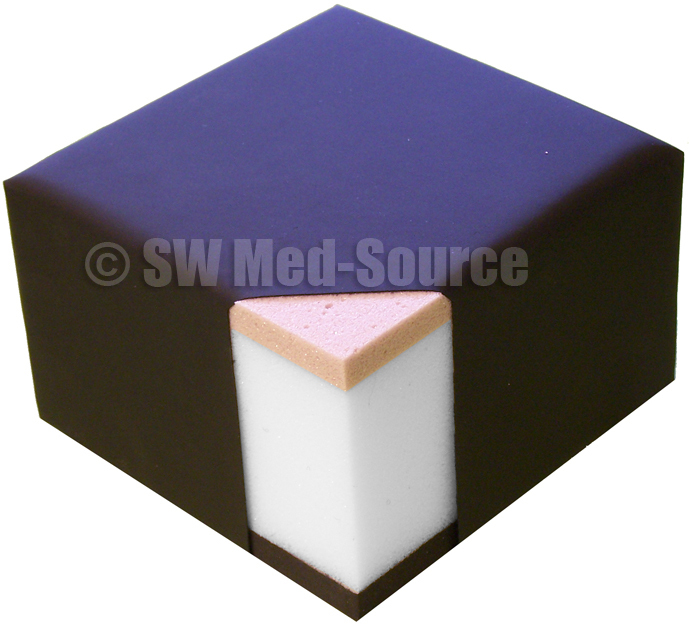 All of our Black stretcher pads are anti-static and conductive. Colored pads are anti-static but are non-conductive. Both types of pads are used in hospitals across the country. All materials are virgin in origin and comply with translucent requirements for all standard imaging and x-ray equipment. Products are constructed with non-penetrable surfaces. Our covers include an anti-microbial additive to protect the fabric - for the lifetime of the pad cover. Our pads are latex free, non-allergenic and are compliant with fire code regulation California Technical Bulletin #117 and #129. According to the factory, this means all materials used in our pads passed the burn test. Add #BFC to stock number if your mattresses need to meet Boston Fire Code. An optional fire retardant material is then wrapped around the foam before it is covered. Pricing for this option is shown below. Note: According to an National Fire Protection Report titled NFPA 267 Report of the Committee on Fire Tests, 2003: "The history of the development of California Technical Bulletin 129 was an effort by the bedding industry to standardize over 100 mattress fire tests that were used for regulatory needs. The mattress industry assisted and supported the California Bureau of Home Furnishing in the development of Technical Bulletin 129 Fire Test for Mattresses. Technical Bulletin 129 was built on strong fire science and remains today the state of the art of fire testing mattresses for public institutions." Our Deluxe and Softcare Stretcher Pads have ultrasonic welded seams that are fluid-proof*. *Note: There is a sewn/ glued vent flap that regulates air flow on all of our pads. However the pad would have to be turned upside down and fluids poured directly into that vented area for any fluids to actually enter these pads. Mattresses cannot be submerged because of this vent flap. Compatibility - We offer the following products: Hill-Rom® Stretcher Pads, Stryker® Stretcher Pads, Steris® Stretcher Pads, Hausted® Stretcher Pads, FHC® Stretcher Pads, Pedigo® Stretcher Pads, Midmark® Stretcher Pads, Gendron® Stretcher Pads and Wy' East Medical Patient Transfer Chair mattresses. This is not to suggest in any way that these replacement pads are made by the above mentioned manufacturers but rather that they are designed to be used with the above manufactured stretchers. Pad Size Offerings: Save money by selecting from one of the standard sizes shown above. These sizes will work with 90% of the stretchers on the market. Or if you prefer to purchase a specific size not listed, then simply contact us for a quotation. If the size is similar, the price may be the same. Colors: Standard stretcher pads are available in Black only. 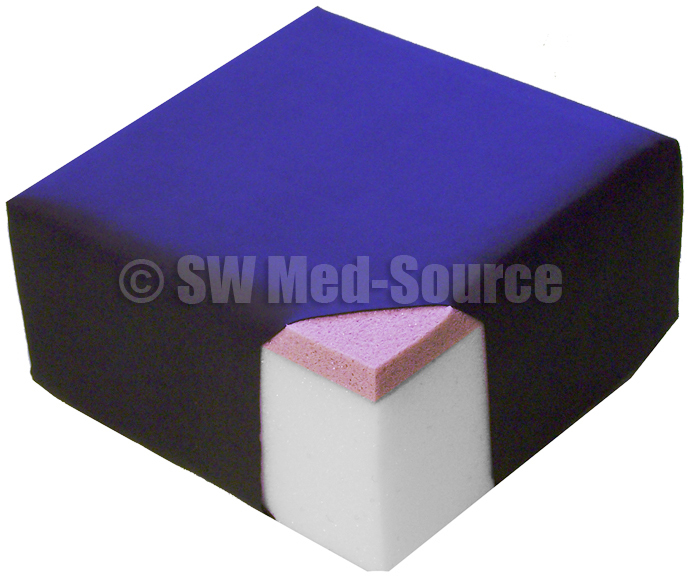 Deluxe and Softcare stretcher pad covers are available in eight different colors. See color choices shown above. Please specify color when ordering. If color is not specified, the cover will be made in Black. Pricing: The above prices are deeply discounted and very competitive. However a quantity discount is available for ten or more stretcher mattresses purchased at the same time. Add $24 to cost and #BFC to stock number if your pads need to meet Boston Fire Code. BFC is a fire retardant material that is wrapped around the foam before it is covered. Hinged pads are also available. Contact us for details. Above pricing is FOB Factory. Freight cost is added to invoice. Quantities discounts are available. A Velcro kit is included with all replacement pads. Delivery: Standard delivery time is about 2 to 3 weeks. Expedited (2 to 4 day) delivery is also available. Please call or email us for more information or an official price quote. Returns: Our policy is standard in the industry. All pads are custom, made to order with your specified material, size and color and non-returnable. Warranty: A limited warranty applies to our stretcher mattresses and pads. It covers any defects in materials and workmanship. Abuse, punctures and tears are not covered. Also, damage to covers resulting from use of disinfecting chemicals specifically designed for hard surfaces also voids the warranty. See below cautions, warnings and cleaning recommendations. Do you need a different mattress size? address and email address. We will then provide you with an official quotation. immerse. Or you may use a diluted bleach solution of 10 parts water to 1 part bleach. Wipe dry with a clean cloth. Do not immerse. Use Lysol I.C. Disinfectant Spray by National Laboratories, Montvale, NJ, per manufacturer's instructions. Reference # 95029-000. Or use a diluted bleach solution of 10 parts water to 1 part bleach. Wipe dry with a clean cloth. Do not immerse. Steris Coverage Spray TB Plus 1629-B4, -08.
mattress and surgery table pad covers. It actually melts the knit cover and Urethane outer cover." to dry out and prematurely crack. The higher the concentration of alcohol, the sooner they will deteriorate. These wipes are NOT recommended for use on our “soft goods” mattress and pad surfaces. chlorine bleach. C. difficile spores can survive routine cleaning products that don't contain bleach." cleaning and disinfecting recommendations, directions and product limitations. surfaces should not be used on stretcher mattress or pad covers. Note: Do Not Apply Tape To Any Mattress or Pad. Call 1 888 424-1740 Mon. - Fri. 8 am to 6 pm CST or e-mail us at: info@swmedsource.com. Copyright 2005 - 2019, SW Med-Source Inc., All Rights Reserved, Opt. 03/19.